It's a packed tech news digest today: we've got details on not one, not two, but three upcoming smartphones from the biggest names in tech, as well as stories on a clean energy truck and some new Sony televisions, all courtesy of our friends at TechRadar. 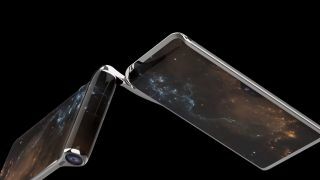 Modern-day smartphones are all rather similar in terms of design and features, but one handset looking to break the mould is the HubblePhone: we only have a concept video to go off right now, but it looks to have two screens (at least), a futuristic foldable design, and plenty of features. The only problem? Makers Turing say this won't be ready until 2020. Motor manufacturers are exploring all kinds of clean energy options for our vehicles besides making them electric, and hydrogen power is one of the possibilities being looked at. Toyota just unveiled a hydrogen cell electric truck that can go 300 miles between refuelling, without the associated polluting emissions that come from petrol and diesel. How do you boost iPhone sales in developing countries? By adding dual-SIM support of course, something users in nations such as India tend to rely on. New lines of code discovered in the latest iOS beta suggest the next iPhone(s) could well come with the option to run two SIMs, but we'll have to wait until the September launch to know for sure. It's fair to say that Netflix has helped to transform the way that we watch TV – if "TV" is even what we should still call it – and Sony has now decided to add a dedicated Netflix mode to its upcoming range of televisions. The mode is designed to better match the way Netflix content is produced, so what you see is more like what the directors intended. We've heard all kinds of rumblings in recent times about a dual-screen Surface device that Microsoft might or might not be planning to release soon, and now there's a new patent to add some more fuel to the rumour fire: it shows a special mode where one half of the screen is used as a touchscreen keyboard, so the device can be used like a miniature laptop.